Janet Jackson’s socially conscious, groundbreaking album Rhythm Nation 1814 will mark its 25th anniversary this month. Released on September 19, 1989, Rhythm Nation established records that may never be equaled. It was the first album to chart three Billboard Hot 100 chart toppers in three different calendar years (“Miss You Much” in 1989, “Escapade” and “Black Cat” in 1990,” and “Love Will Never Do (Without You)” in 1991), It was also the only album to have seven singles reach the top five (“Rhythm Nation,” “Alright,” and “Come Back To Me,” in addition to the previous mentioned tracks.) There could have been an eighth top five single. Despite getting airplay, “State of the World” was not released as a single and Billboard’s chart rules at the time required all charting songs to be formally released as a single. Despite her label’s insistence that Rhythm Nation follow in the same vein as her previous album, Control, Jackson wanted Rhythm Nation to have a more serious tone. Rhythm Nation tackled the issues of homelessness, racism, drug abuse, and even school violence. To date, nearly 10 million copies of Rhythm Nation have been sold in the U.S. alone. 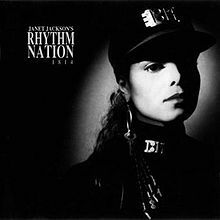 What is your favorite track of the Rhythm Nation album? And do you remember the extended version of “Miss You Much” featuring the chair routine? That’s the end? No!